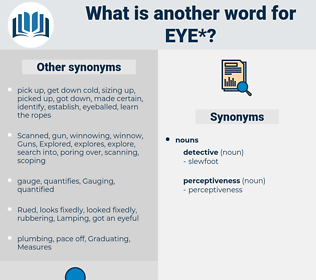 What is another word for eye? forecasts, sees, Les, discusses, mulls, walnuts. Les, peek, scrutiny, attentive, agreement, wink, vigilance, lookout, opinion, gander. perceived, concerned, considered, Regarded, Examined, Indicated, designated, assigned, named. 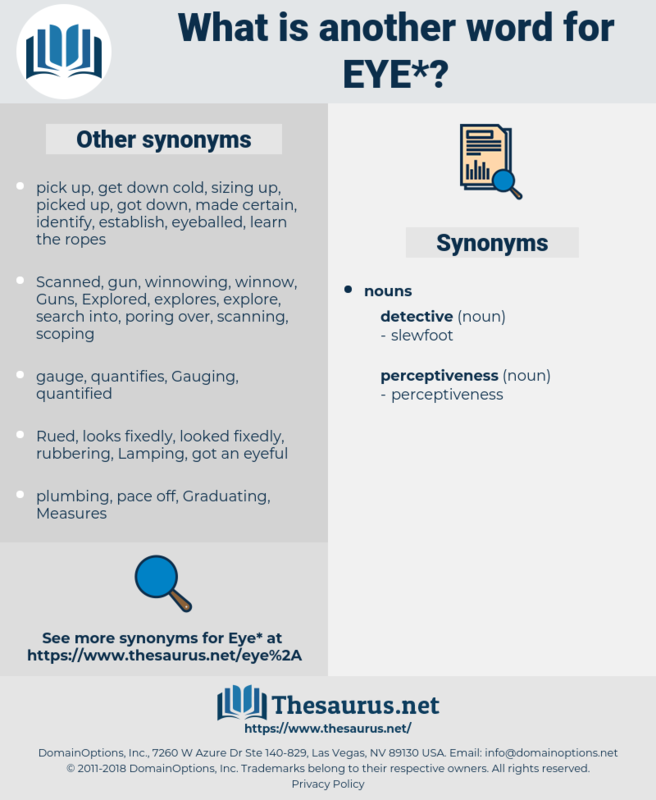 eyelet, eyepiece, eye-opener, ophthalmic, ear, ocular. forget, ignore, look away, disregard, disbelieve, overlook, neglect. But his eye was caught by a light in the window next to his own; and the window was open. At last, during a pause, Sir Philip caught Mr Bray's eye, and nodded towards the other room. eu, Ay, i, Aye, ew, ai, ee, e, ea, i., ewe. human face, face, visual system. oculus sinister, od, os, peeper, simple eye, ocellus, Oculus Dexter, stemma, compound eye, naked eye. sense organ, receptor, sensory receptor. discernment, judgement, judgment, attention, attending, sagacity, sagaciousness. conjunctiva, epicanthus, sclera, Ciliary Artery, nictitating membrane, lid, lens, RETINA, choroid coat, orb, canthus, uvea, eyeball, third eyelid, cornea, lacrimal artery, Vena Lacrimalis, choroid, lacrimal apparatus, iris, sclerotic coat, Arteria Centralis Retinae, Musculus Sphincter Pupillae, epicanthic fold, ocular muscle, uveoscleral pathway, Ciliary Body, eye muscle, lens of the eye, eyelid, crystalline lens, lacrimal vein, central artery of the retina, Arteria Lacrimalis, Arteria Ciliaris, aperture, pupillary sphincter, palpebra.